Don’t remember where I first heard of the Gearfire Student Productivity blog I’m thrilled for the referral. One post this week really impressed me: “4 ways to use Wikipedia (hint: never cite it)“. When I hear Wikipedia bias, the less damaging type usually goes something like “high school students shouldn’t cite an encyclopedia in research papers, so they shouldn’t use Wikipedia at all.” Students, then, get this idea that Wikipedia is completely off-limits to them. Don’t throw out the baby with the bathwater! Background information: The Grapes of Wrath makes a lot more sense if you understand the dust bowl of the depression. The fighting in Iraq makes more sense if you understand that it wasn’t until after World War I that it became one country under the British. Knowing the context of your topic can help you understand that material better and write about it more clearly. I think the 4 ways article combats Wiki-bias really nicely. So nicely that I shared it with the entire teaching staff at my school. Also in Wikipedia news, a second student of mine contributed to Wikipedia this week. Now he’s on a mission to clean up articles and watch for vandalism. He’s even subscribed to an RSS feed to watch for potential vandals. His first edit, by the way, was to the Vin Diesel article. 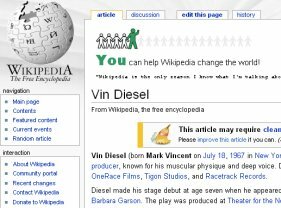 He noticed that Diesel’s birth name read “Luke Skywalker”, commented that it seemed like someone was messing with the Wikipedia, so I encouraged him to revert the article to its pre-vandal condition. He did and we moved on with class. Glad you liked the article! It was written by Rebecca from http://www.protoscholar.com, a new author at Gearfire who will be writing every tuesday. I’m glad to hear about your student who helps police wikipedia for vandalism. It’s people like him that keep it going despite all the other “hilarious” teenagers that make annoying little changes. I am also really glad you like the article. There can be such an all-or-nothing attitude about Wikipedia , which is sad because there is some great collaborative work going on there. I am excited to hear that you are getting your students involved as well, since the process can really teach them a lot about critical thinking, technology, and collaborative work in a web 2.0 world. BTW, your school sounds amazing! Geoff and Rebecca: Thanks for stopping by! The “annoying little changes” Geoff mentioned can be the worst. Everyone knows that Vin Diesel probably wasn’t born with the name Luke Skywalker. I teach my students that’s a glaring falsehood but that it’s the less obvious ones will really get you. What if Mr. Diesel’s birthday had been edited? That’s why my students and I worked this week on studying the history tab of Wikipedia articles. The kids are remarkably good at spotting a probable vandal!